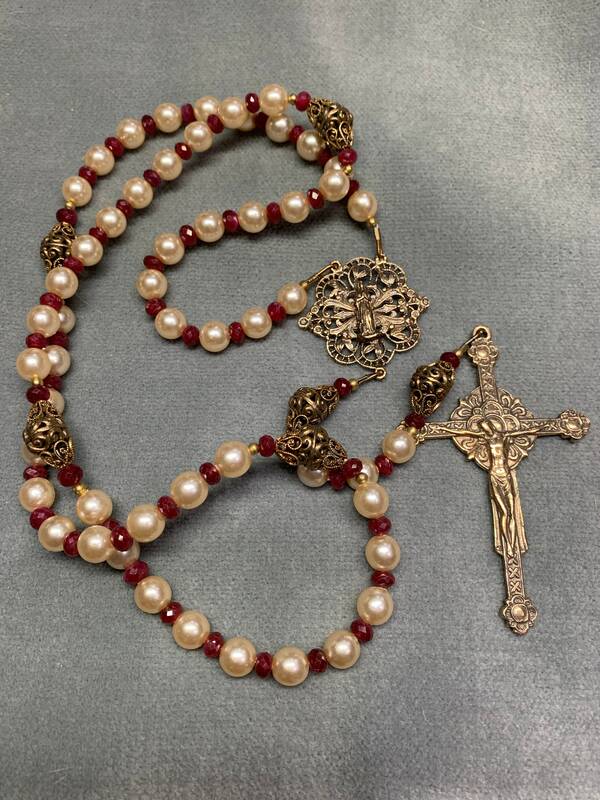 Offering plump, creamy 8mm freshwater Pearls separated by genuine Ruby in a new Bronze Rosary. 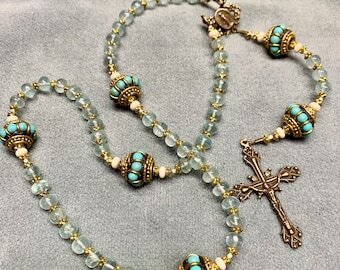 The Our Fathers are openwork Bali Beads with a heart motif, and their ornate nature is continued in the glorious center of the Blessed Virgin and the Renaissance-inspired, double sided Crucifix. This Crucifix is gloriously stylized both front and back -- Jesus on the front, and Madonna and Child beautifully carved on the back. All have been cast in solid Bronze. 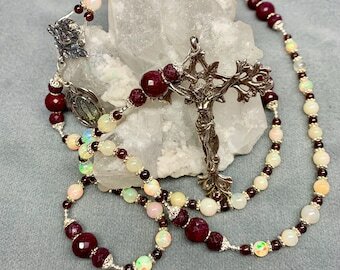 The warm bronze is reflected in the creamy tones of the Pearls, and the rubies separating the Hail Marys glow in the warmth. This is a cable Rosary, strung on 49-strand, 40# test strength stainless wire coated with plastic. Double crimps are used for durability. Strung Rosaries are loved for their compact size and ease of praying. In fact, this Rosary is a pleasure to pray, flexible and silky smooth, with easily discerned Our Fathers -- No confusion as to when you've reached the end of the decade. Length is 20 inches. 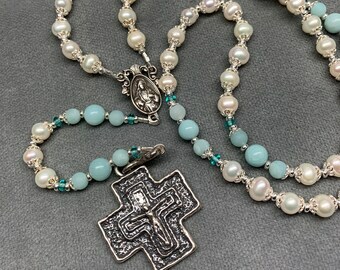 8mm Hail Marys and 12mm Our Fathers make a more substantial Rosary that feels good in the hand without being heavy. Instructions for the Rosary are included. Check out the online store at HeartFeltRosaries.com and see the whole collection!